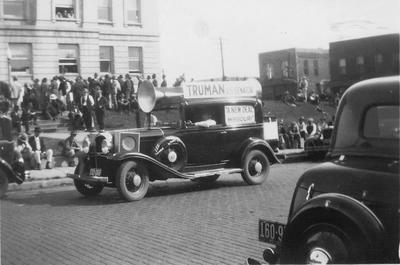 In 1935, Samuel Saia, a garbage collector from Buffalo, New York, and a devout Jehovah’s Witness, purchased an electroacoustic loudspeaker and affixed it to the roof of his Studebaker automobile. On a weekly basis, he would drive up and down the streets of upstate New York, using a portable phonograph to broadcast the recorded sermons of “Judge” Joseph Rutherford to all who could hear. Saia’s practice was common among Jehovah’s Witnesses of his time, who took advantage of all sorts of media and auditory technologies to spread the word of God. But it is inadequate to think of their use of “sound cars” as merely instrumental. Instead, Saia and his co-religionists practiced what I have described elsewhere as “sound car religion.” That is, their choice of media was inextricably entangled with their message: sound cars and loudspeakers materialized their imperative to preach the gospel as loudly and widely as they could, their rejection of a popular inclusionary ideology that assumed sectarian differences were best kept to oneself, and their refusal to abide by the liberal norms of civil restraint that often seemed to govern American public spaces. Prayer can be thought of as the act par excellence by which we give explicit recognition to the limits of human knowledge and mastery, and so, adjust and orient ourselves to a world that exceeds our grasp. It is more, therefore, than an encounter with a transcendent other, for it entails that we give voice and gesture to our frailty and fear, to our un-Promethean nature. The place we ascribe to that dimension of human existence—to that inarticulate, gesticulating being—within social life strikes me as key to the kinds of habitable world we are capable of making. This is one reason—by all means, not the only reason—why we should be interested in prayer. Prayer can become laden with the burdens and conflicts of history. The mezquita-catedral of Cordoba combines a mosque, constructed between the eighth and tenth centuries, and a Catholic chapel, built within the inner sanctuary of the mosque during the sixteenth century. 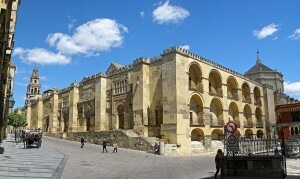 Since the building of the chapel five centuries ago up through the present, only Roman Catholic ritual practice has been permitted, though from around the year 2000 a growing movement among Muslims in Spain has sought permission from the church to be allowed to pray within the walls of the vast sanctuary. The conflict has led to a number of arrests over the years, as Muslim visitors have sought to defy the ban and have begun to perform the words and gestures of Muslim prayer within the space of the mezquita-catedral. The weight of history lays heavily upon these acts. For many Spanish Catholics, the Reconquista undertaken by the Roman Catholic monarchs remains the foundational pillar within the edifice of Spanish identity and history. From this perspective, the transformation of mosque into cathedral and the displacement of Muslim salat by Roman Catholic mass are not simply historical events to be reassessed and revised, but rather, remain essential to the symbolic architecture of the Spanish soul. For Muslim visitors, in contrast, the mosque stands as the embodiment and expression of a highly celebrated period within the history of Islamic societies, an inheritance that is as much theirs as it is Christian Europe’s. For some, the enchanting beauty of the sanctuary solicits a passional response which seeks to find expression in prayer. In both cases, the turning to God in prayer is made across a dense fabric of historical relations, and carries both the burdens and the possibilities that this history offers. Co-Principal Investigator is Terence Mckiernan. I propose to study the religious/spiritual histories of adult Catholic survivors of clerical sexual abuse with a view toward understanding the role of prayer in their efforts to reclaim their lives from destruction and alienation. The most disastrous consequences of abuse included a radically diminished self-image; persistent feelings of shame; a perceived loss of agency; a corrosive and objectless anger; pervasive anxiety; self-abuse (with drugs, alcohol, violence, and destructive sexuality); relational failure and social isolation. The project explores the extent to which prayer and praying played a role in restoring survivors to themselves and to their worlds (in the process remaking both themselves and the world). What makes these questions so vexed in this context is that the abuse of children by priests was always religious in nature. Survivors were profoundly hurt in that area of their lives from which they might have drawn the deepest sustenance. Prayer and praying contributed to survivors’ flourishing, but this often entailed great internal struggle with God (in the various forms God assumed for survivors over time), with their inherited and embodied Catholic imaginary, and with their circle of significant relationships (on earth and in heaven). Survivors first needed to restore a capacity for praying that had been effectively taken from them by their abuse. They invented or improvised new hybrid ways of praying to replace the ones lost to abuse, sometimes by reworking childhood prayer practices, but just as often looking beyond Catholicism to spiritual sources available on the wider American religious landscape. Survivors prayed in communities of survivors, with prayer serving to organize and empower a counterpublic that prayed together while seeking justice and recognition from other Catholics and from the church, creating a prayerful practice of redress. The project approaches prayer in its full polyvalence, including prayers that are retributive and condemnatory. I am in the process of establishing a network of contacts among survivors in Chicago and around the country, among those who remain in some relation to Catholicism and those who have more or less rejected it. I will establish field sites in four dioceses with the help of Victim Advocates, a diocesan office mandated in 2002 by the American bishops, as I work with survivors in Chicago and nearby cities who are for the most part unaffiliated with the church. Initial conversations with survivors will be by telephone, e-mail, and Skype (if they are outside of Chicago), in person locally, and I will work from a list of questions prepared with the assistance of survivors as a starting point. I will follow these with more open-ended conversations in person, which will be recorded (and eventually transcribed by a bonded transcription service). The focus throughout will be on survivors’ evolving life stories, with special attention to their prayer practices over time, their relationship to the ways of praying they inherited and those they have chosen or created as adults, in order to understand prayer’s contribution to the restoration of their confidence, happiness, relationships, and social and moral connectedness. The project looks at lived prayer practices in a religiously perverse context, in which the resources and figures victims may have called on for help were turned against them. Nonreductively it takes praying as the medium by which people engage supernatural figures and realities they understand to be really real and efficacious. The broader impact of the project is that given the number of survivors, the social consequences of the deep and lasting pain of abuse, the impact of the crisis on Catholicism and on the reputation of institutional religion, the project addresses matters of wide-reaching public import.